Pallet Racking commonly used in warehouses. 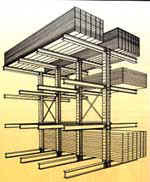 This is the most common design of pallet racking used. The standardized "teardrop" connection design makes the uprights and crossbeam interchangeable with those from other manufacturers. This design is very versatile and the boltless design simplifies reconfiguration of beam levels. The alternative to boltless racking is structural pallet rack which is assembled with mechanical fasteners (usually bolts) and may offer higher capacities. Structural pallet racking is also sometimes designed into the structure of the building itself supporting the roof and eliminating the need for I-beams. This shows the most common configuration of selective pallet racking where single pallet depth racking is placed back to back. This configuration can be used with wide aisles (more than 11') using a standard forklift, in narrow aisles(8'-10') using a reach truck, and very narrow aisles (less than 6') using order selectors, turret trucks, and swing mast trucks. Racking system that incorporates a carriage or other sliding device to allow you to feed multiple pallets into the same location "pushing back" the previous pallet. Can be used in wide aisle and narrow aisle applications. Racking system which uses some type of gravity conveyer system built into each racking level. Pallets are loaded in one side and flow to the other side for picking. Works well for high density storage where first-in-first-out (FIFO) rotation is necessary. Racking system in which the shelving supports are connected to vertical supports at the rear of the rack. There are no vertical supports on the face of the rack allowing for storage of very long pieces of material such as piping and lumber. Wire decking can be used with Selective Racking and Cantilever Racking. Generally used when product is placed into racking without pallets. Due primarily to safety reasons I am a big proponent of wire decking even when pallets are used. Wire decking increases worker safety, productivity, and reduces product damage. There are other types of decking available including solid decking. Fire inspectors generally do not like solid decking since it reduces the effectiveness of sprinkler systems.